In a previous post (About our Bikes) I mentioned some general differences between our touring bikes and a typical road bike. Here’s an introduction to the specific bikes we’ll be riding on our TransAm and why their specific features are designed to help us along our adventures. At a glance there is nothing unusual or extraordinary about our bikes–except our handlebars. I often catch other cyclists doing a double-take when they glance at our bikes and I’m sure it’s because our handlebars are unconventional. 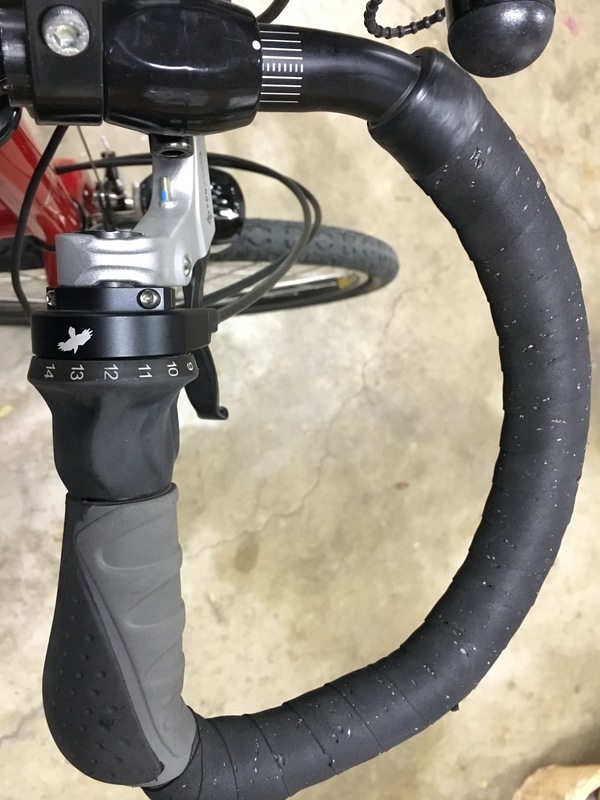 Sometimes called “butterfly handlebars”, they’re sort of like traditional road bike handlebars, except flattened so that they’re on the same plane as the road. While not so attractive, they’re comfortable because they afford a number of hand positions. They’re also designed to keep us in a more upright sitting position rather than leaning over in the classic Tour de France pose. (Check out this excellent overview about the various kinds of handlebars and why some are better than others for touring.) In the photo here I also have a t-shaped attachment in the center designed to accommodate additional stuff, like my speakers, iPhone mount, etc. We’ll cover that in a future blog about our “cool accessories and gear”. Oh, and be sure to click on the photo to zoom in so you check out the fork cap–Joy bought me a custom cap that highlights my Stanford alumnus status. When you look at one of our bikes it looks like it only has one gear. There’s no derailleur and the chain doesn’t wrap around different sized sprockets. Do we really only have one gear? Of course not! One gear is fine for cruising around Stanford campus where it’s all flat, but no so much when you’re planning to ride up and over the Sierras. And the Rockies. And we’re each planning to carry 50-60 pounds of stuff. Instead, our 14 gears are cleverly tucked into the Rohloff hub that sits at the very center of our back wheel. Why would we want such a weird thing? First and foremost, given the amount of cycling we’re going to be doing, and the fact that we’ll often be in small towns (and even spending some time out in the wilderness between towns), it’s important for us to have extra durable, low maintenance components. Because the gearing is encased we get additional reliability and durability across all the tough road conditions we expect to experience on our adventures. And we don’t have to clean the sprockets – something you’re actually supposed to do regularly with a normal bike. Did you know you’re supposed to clean your chain and chainrings every couple of weeks? Seriously. Because of the way the gear box works, it also makes shifting way easier. You can even shift gears without pedaling (something you can’t do with a typical derailleur system). That means we can be a standstill, waiting for the light to turn green and shift from a higher gear (like 10) down a gear that’s easy to pedal (like 5) so we can get momentum going right away. 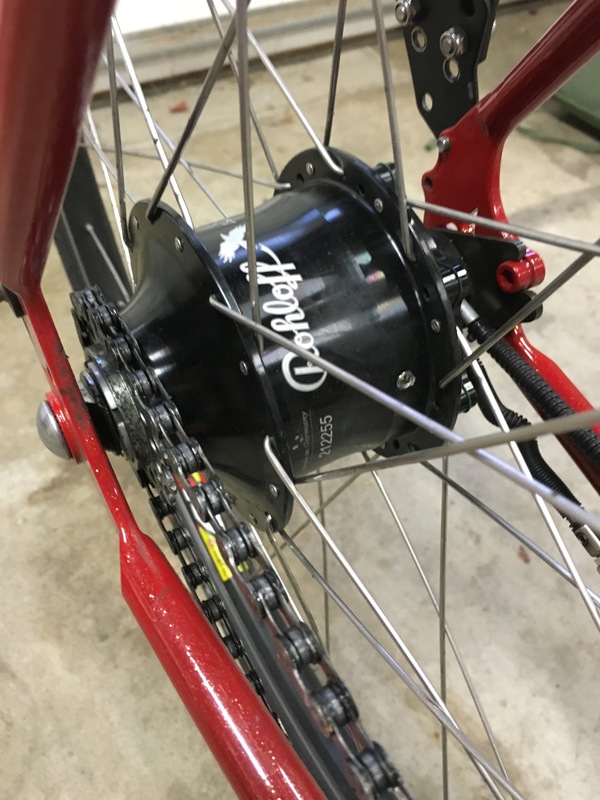 Using the Rohloff we can shift across a few gears at a time while on a derailleur you have to shift in smaller increments or risk torquing the chain and causing it to fall off – or worse – snap). But why only 14 gears? Why not 27 like road bikes? The Rohloff gears are spaced out evenly which means that each gear is a unique gear. With a standard derailleur there’s a lot of overlapping gears. For a typical 27 gear derailleur (with 9 sprockets in the back and 3 in the front), it turns out that by the time you discount gear overlap you only end up with about 14 different gears anyway. A more detailed explanation of gear overlap. The 14 gears from the Rohloffs provide a wide range of power: 526% power differential from gear 1 to gear 14. Our front wheels have built-in hubs that generate electricity to power our really powerful front lights. 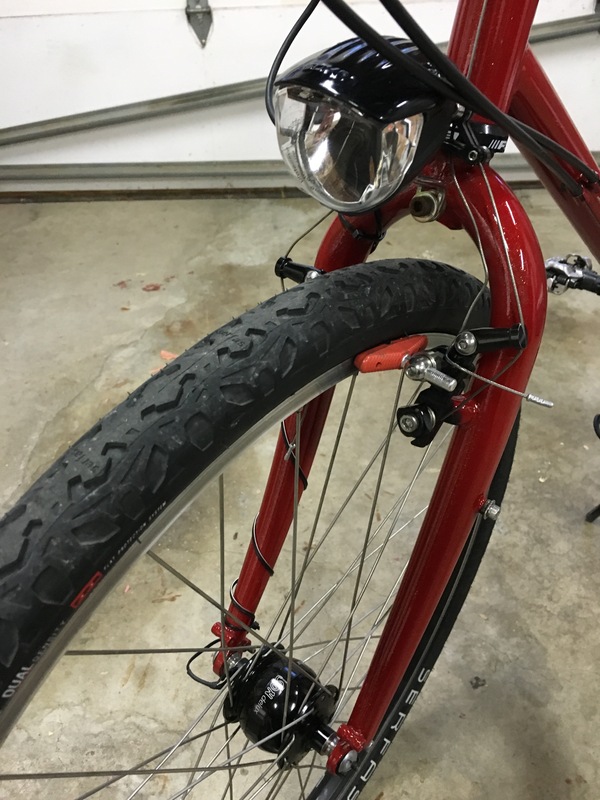 Whenever the front wheel is spinning, we’re using that energy to power the front light. No need to worry about dead batteries! Even better, there’s a USB plug so we can charge up our phones, GPS, or other devices, while we’re riding. 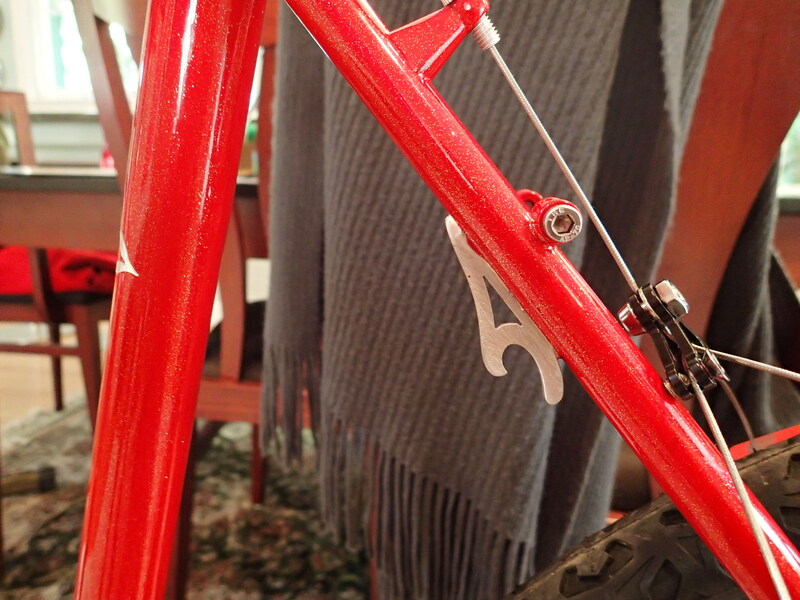 (The USB connector is what’s dangling off the center of my handlebars in the photo at the top.) This feature will simplify the Ritual of Charging at the end of each cycling day. 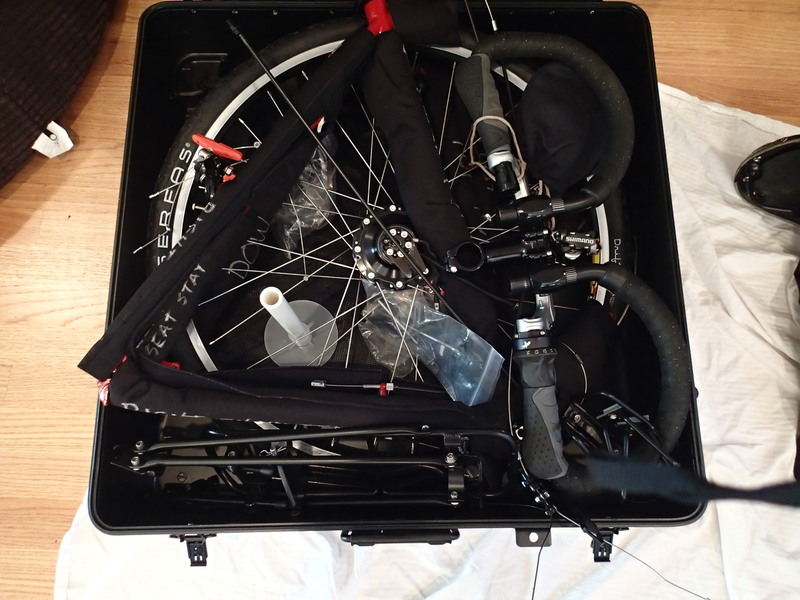 Even though our bikes are big beasts, we can take them completely apart, pack them in their custom cases and take them with us around the world. We’ve already taken them to Bali. 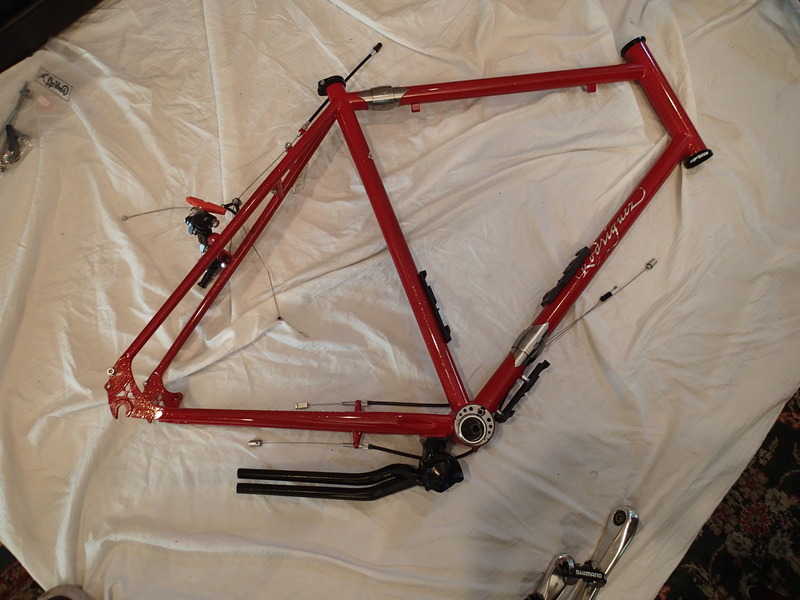 Our bike frames use an “S and S coupling” to separate the frame into two pieces. 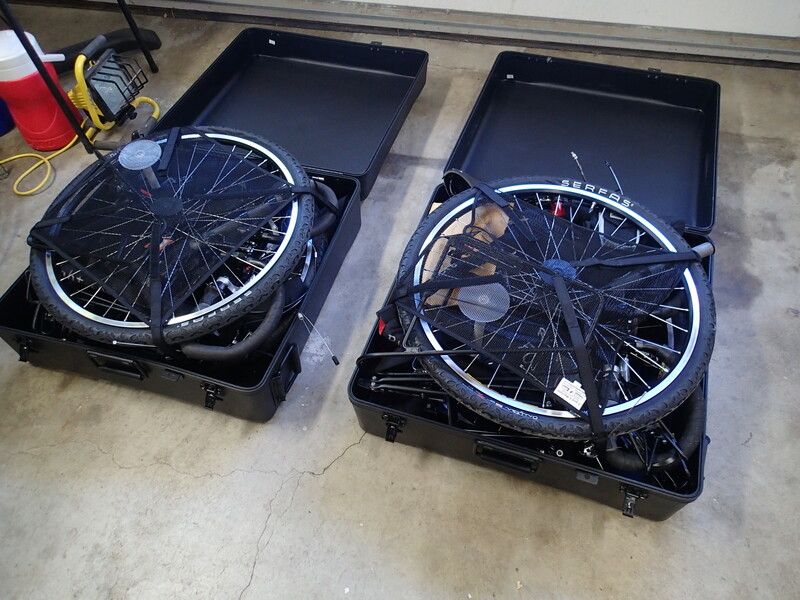 In the end, we can pack each bike into a 26″ by 26″ by 10″ case. That means we don’t have to pay special (exorbitant) airline fees for shipping oversized luggage. 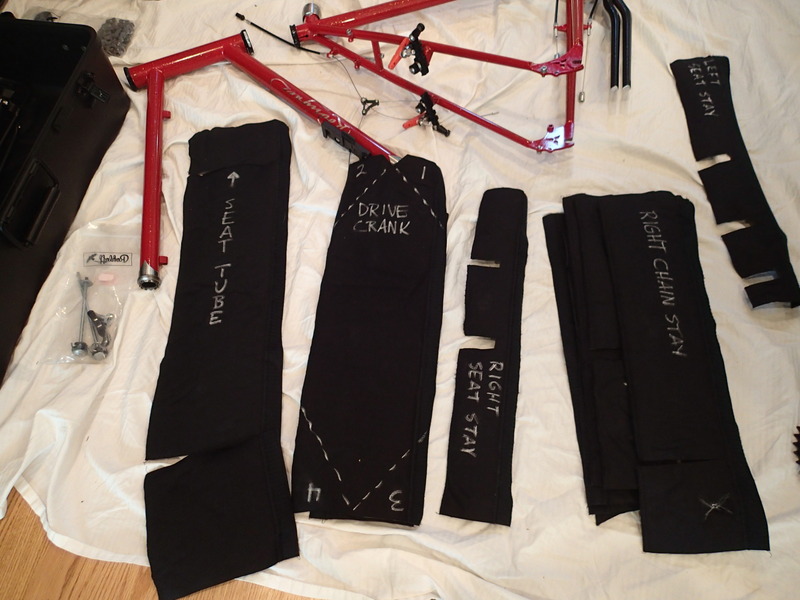 It takes 25-30 minutes to disassemble and pack each bike and about 45-60 minutes to assemble each bike. This feature isn’t particularly relevant for the TransAm (except getting the bikes back to either Texas or California at the very end) but very applicable for future travel to South America, Europe and Asia. Our completely disassembled bikes packed into their shipping boxes. Tony’s bike partially unpacked and components laid out & wrapped in protective covers. Each piece has its own custom protection piece. Note the frame is two pieces. Our bikes are made for standing – on their own. 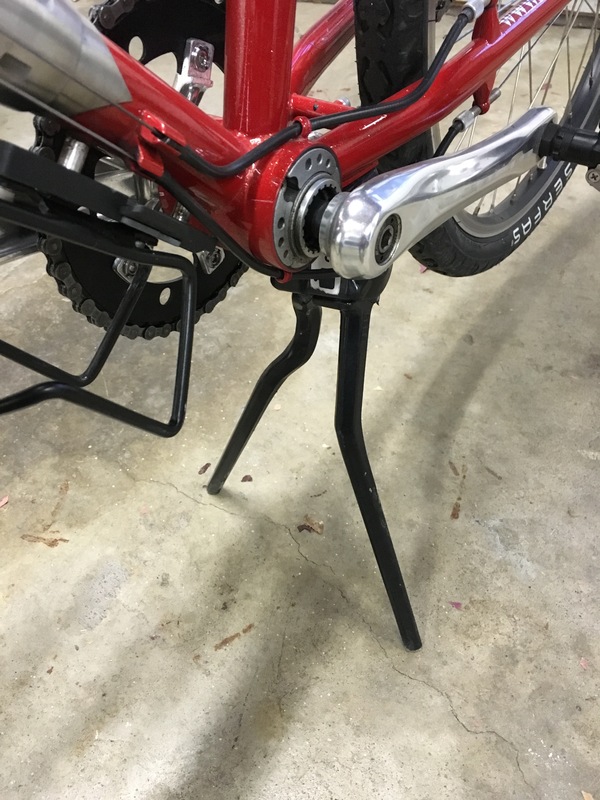 Since our fully loaded bikes are going to be so heavy, and because the ground is never as flat and as smooth as you’d like, we’ve got extra heavy-duty, double kickstands. And once you’re on a break, you might as well have a beer so that built-in bottle opener sure comes in handy! I’ve already used that bottle opener to open a whole six pack of beers (sadly, just old beers I was preparing to pour down the utility sink).